Individuals seeking to lay the foundation of effective HR management. Human resources incorporates a number of interrelated job functions with a primary mission of recruiting, selecting, and retaining qualified employees who will assist the organization in achieving its goals and objectives. In this course, you will gain the foundational knowledge necessary to help your organization reduce costs, avoid potential lawsuits, and improve your ability to handle challenging HR issues. This program is ideal if you are just starting out in the HR profession, planning to make a career change into an HR position, or performing HR duties as a part of a non-HR job. Recently updated content reflects changes in legislation and provides an overview of HR roles and responsibilities. - Create a stronger alignment between your organizational and HR goals. - Build your knowledge of HR practices. - Apply newly learned HR knowledge to practical activities, similar to those required on the job. - Plan for ways to transfer the knowledge and skills learned from training to on-the-job tasks. 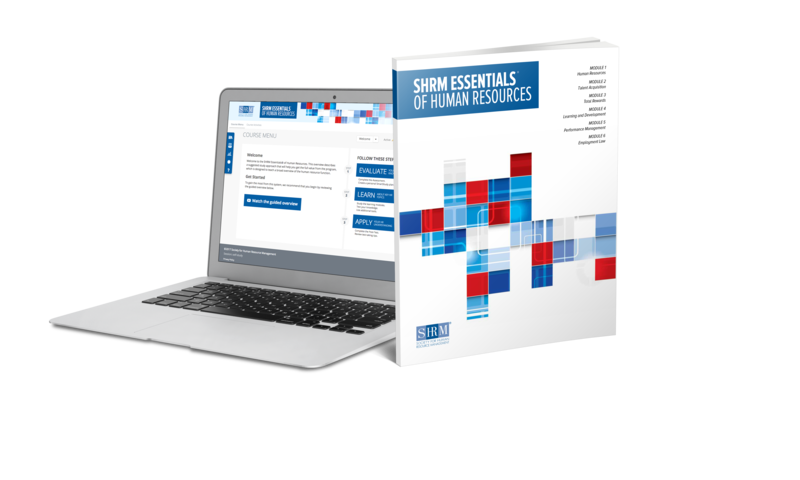 Program fee includes the SHRM Essentials of Human Resources. Participants who cancel their registration for any SHRM Essentials of HR Management (2 day in-person) or Virtual Essentials of HR Management (4 weeks) programs should follow the same guidelines above, except you will have to return SHRM Essentials of HR Management unopened; otherwise, you will be charged the purchase price of $385 SHRM Member/$460 Nonmember for the SHRM Essentials of HR Management. Your refund will be equal to the registration fee, minus the applicable cost of the tools, minus a $250 administrative fee. Maximum capacity reached for SHRM Essentials of Human Resources. What would you like to do?